I love when reading and play collide to bring hours of fun and learning. 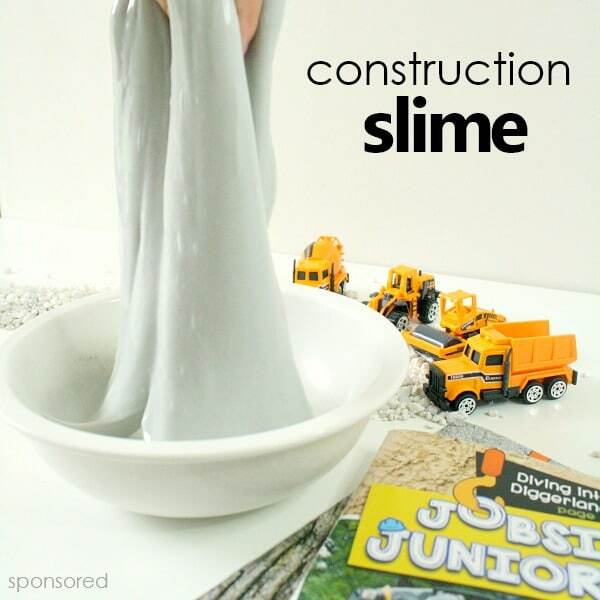 Today I’m partnering with Jobsite Juniors™ children’s magazine to share our most recent construction site slime sensory play idea. The timing is absolutely perfect for our family. Down the street from our home we are watching a house as it’s built from demolition of the old home all the way through to building the new. We’re also meeting with contractors about some possible changes to our own home, so that has brought up a ton of questions about building, architecture, materials and more. 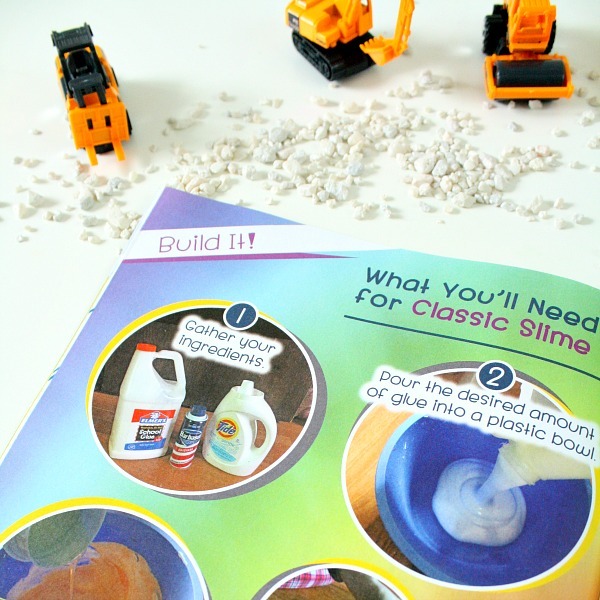 If you have kids who are fascinated by slime or construction, they’re sure to love this construction site slime recipe and Jobsite Juniors magazine. 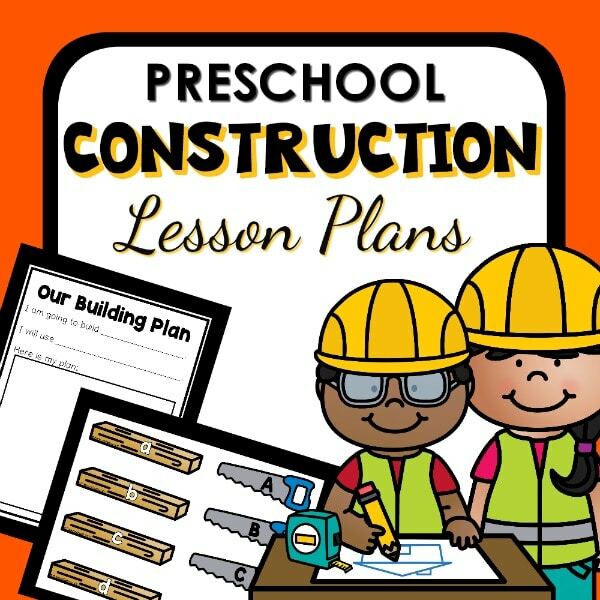 FIND EVEN MORE CONSTRUCTION THEME ACTIVITIES IN OUR PRINTABLE CONSTRUCTION LESSON PLANS. 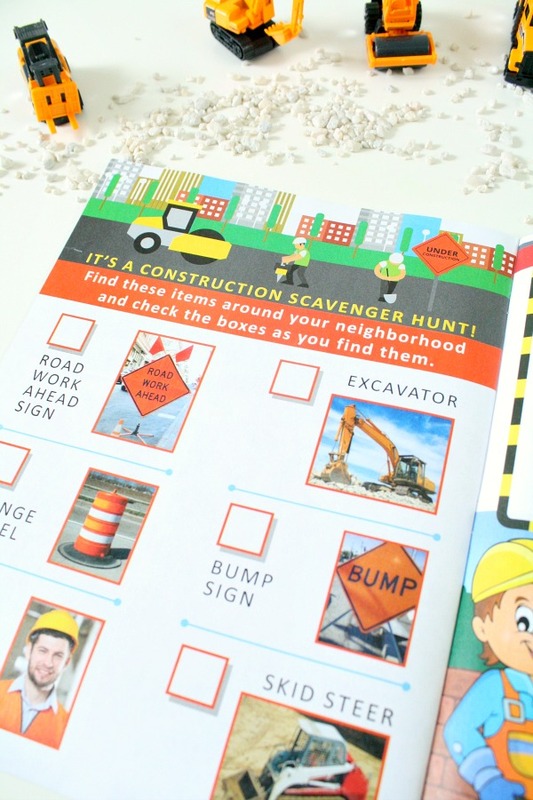 Jobsite Juniors is full of construction fun, informational articles, activities and more. It is intended for kids ages 5 to 10, but if you are reading and exploring with your older preschoolers I think they would also latch on to many of the articles and activities in the magazine. Double win if you have kids of multiple ages! Personally I really like the variety of information included in each bi-monthly issue. Older kids who are eager to know intricate details will love the Equipment Explained, Project Spotlight, and On the Go! sections. But they are also very accesible to younger readers and full of interesting pictures that help kids connect with the information. 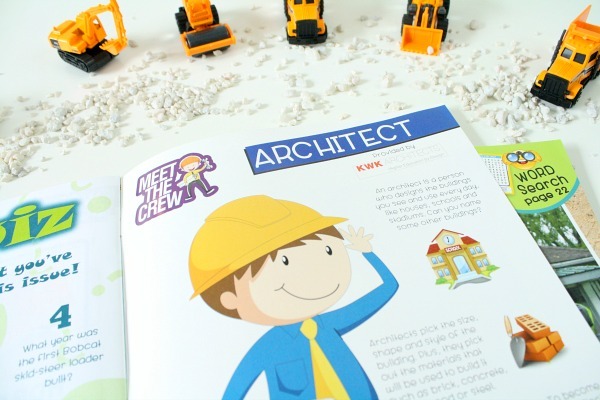 I think it’s important for kids to know the wide range of career opportunities out there, so I also really like the Meet the Crew section in each issue that introduces kids to a career within the construction field. 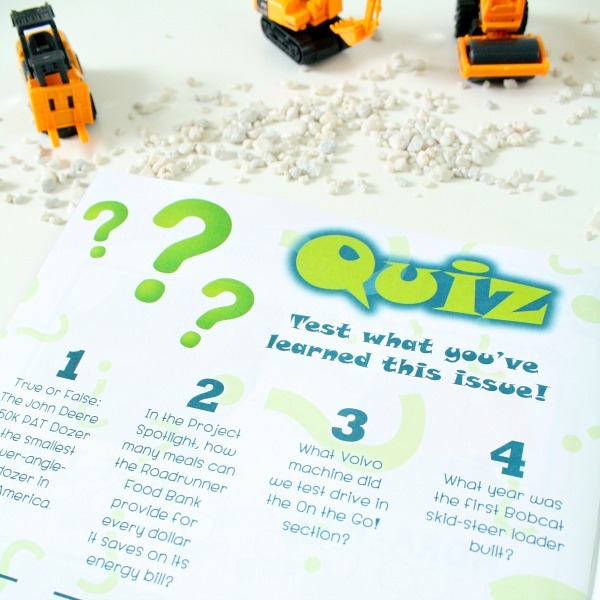 Each issue also weaves in a bit of reading comprehension practice by including a quiz section. And Jobsite Juniors isn’t just a quick read that your kids will be done within a few minutes. There are quite a few activities integrated into the magazine. You’ll find hidden pictures, word searches, coloring pages, and more. 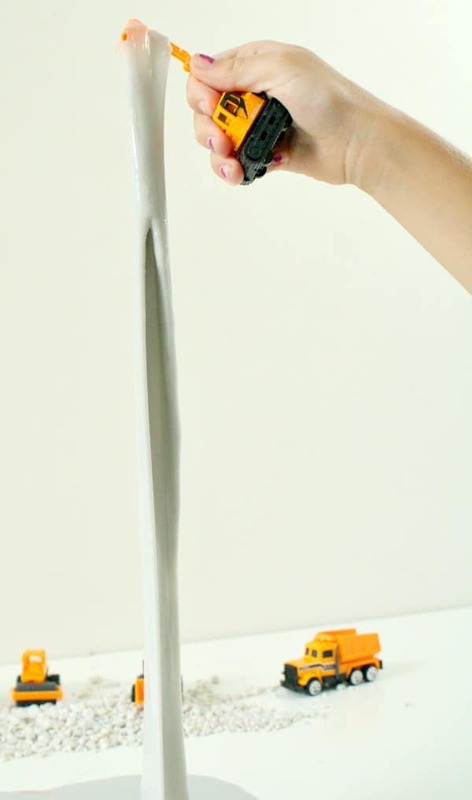 There are also activities that extend beyond the magazine like scavenger hunts (pictured above) and a Build It section that introduces kids to a hands-on project they can try at home. Want to see a sample online copy? Sign up for a free online copy here. If you’re an Amazon shopper and a US resident, pop over to Amazon to subscribe. Or save on your subscription with a special code just for Fantastic Fun and Learning readers. 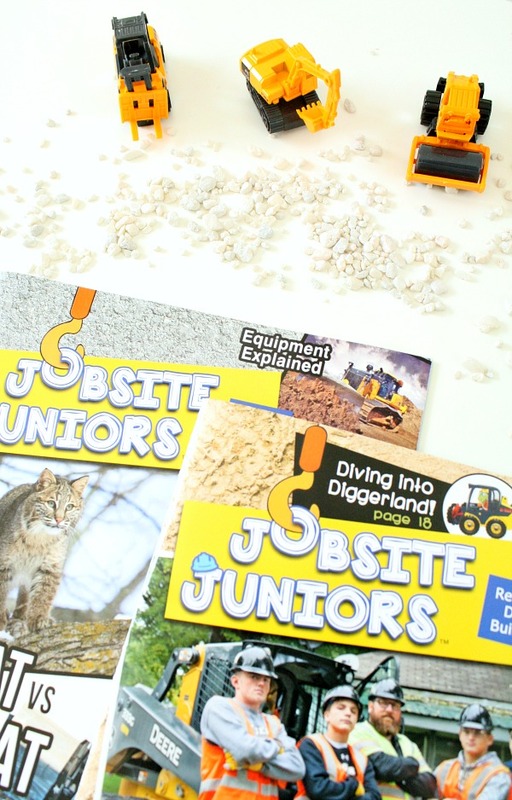 Pop over to Jobsite Juniors, and use the code JJFUN to save $5 off of US and Canadian subscriptions. Need a bulk subscription for schools, events or retailers? Fill out this form and Jobsite Juniors will be happy to work with you. Making slime is always a bit of a science experiment. That’s part of the fun! If you have a basic recipe you know and love, go ahead and use it. 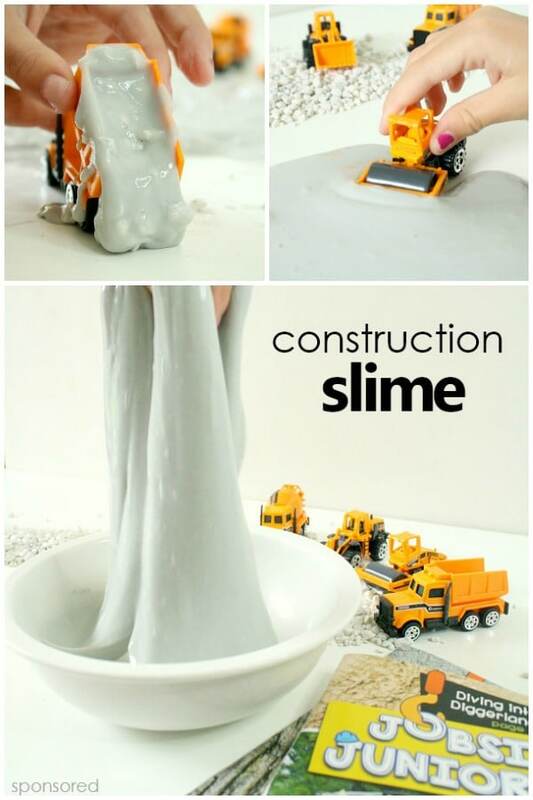 Then add in the elements below to make construction slime. We used a basic liquid starch and glue recipe and added gray acrylic paint in step 2 of the directions. 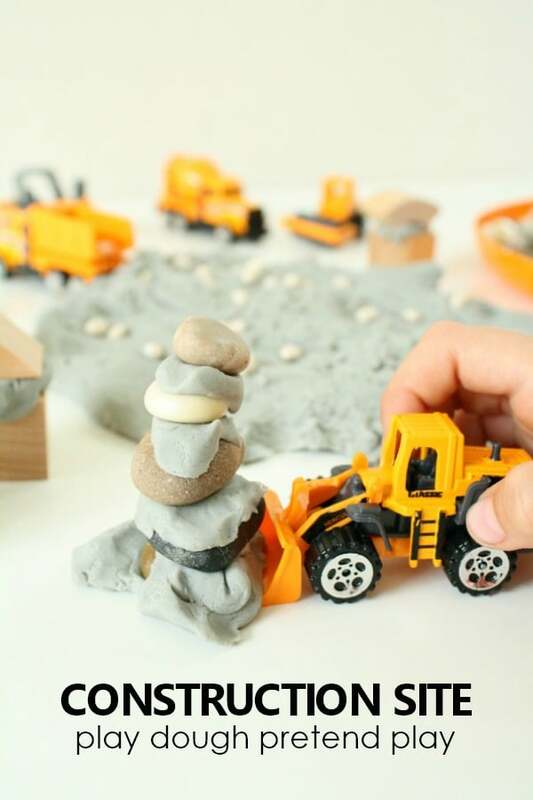 To add in some texture I also placed gray aquarium gravel in our play space, and of course we included some construction vehicles to encourage creative pretend play. 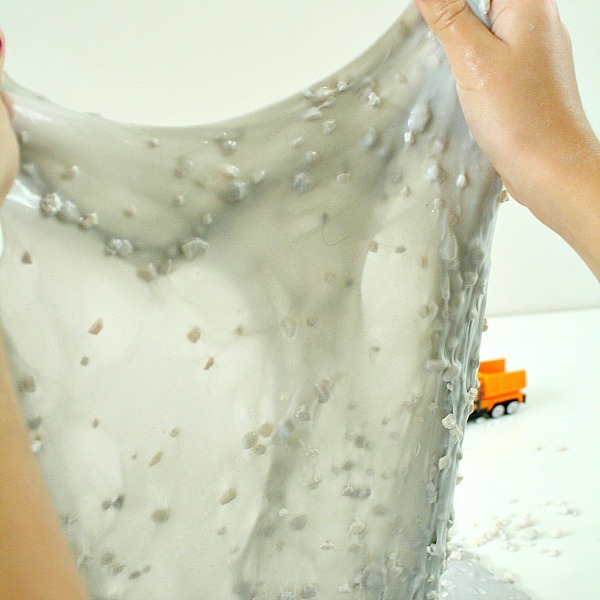 My daughter chose to play with the smooth slime for a while before adding in the gravel. 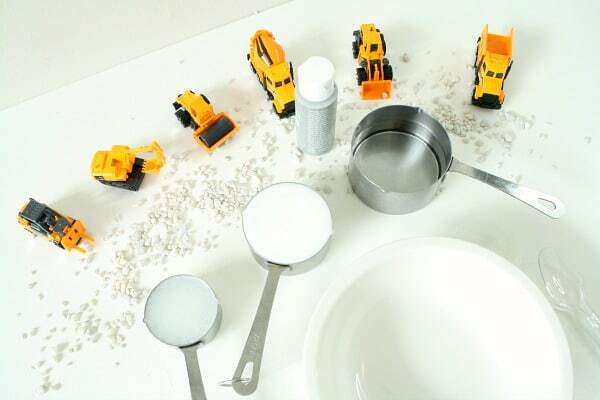 She tested each of the construction vehicles to see what effect each would have on the slime. She experimented with the ways she could stretch and manipulate the slime with the vehicles, too. Then it was time to mix it up and add some texture with the gravel. She loved the combination of rough gravel and smooth slime. It defintely made the slime heavier and she liked watching as she stretched it and flipped the slime to make large bubbles. 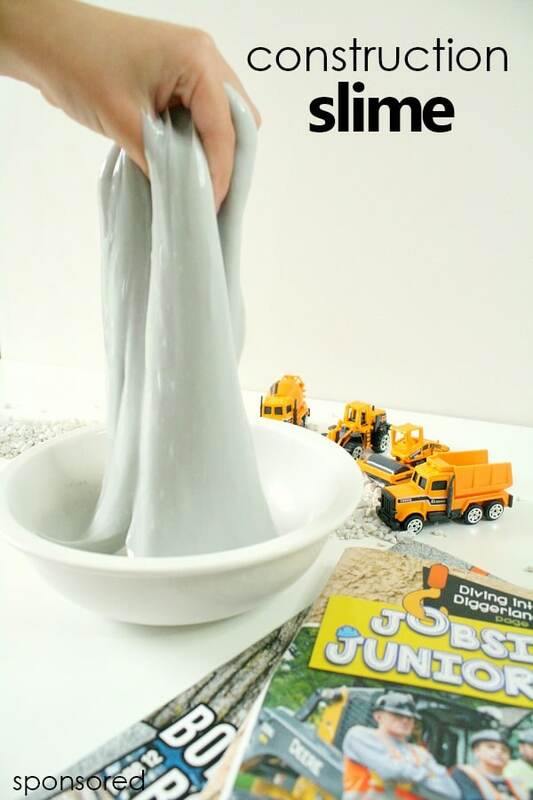 The dump truck was perfect for transporting slime and watching it slowly ooze out. This construction site slime sensory play was such a concrete way to tie together all we’re learning in our Jobsite Juniors magazines. I bet your kids will love them both, too! Remember you can sign up for a free online sample copy of Jobsite Juniors here. Set up your own construction play dough invitation with many of these same materials. I haven’t heard of this magazine so I’m excited to check it out. So glad to help you discover it! I bet your kids will love the magazine.